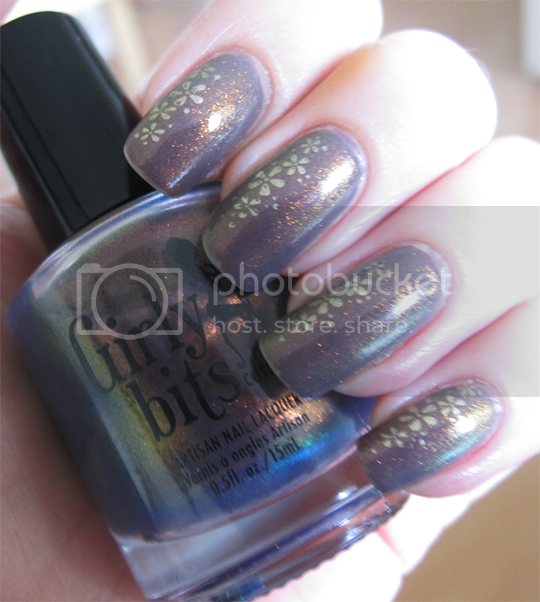 Remember not too long ago, I posted about some indie nail polishes I was lusting after? One of the brands on my ‘must try’ list was Girly Bits and when I made my first order, I spotted one that I’d somehow missed on my first browse of the site. As soon as it caught my eye, it went straight in my basket! Feast your eyes upon Girly Bits Shift Happens. First of all, great name right? Great polish too. As the name would suggest, it has a spectacular colour shift from deep orange to bright green. Unfortunately, as with most polishes of this nature, it is super hard to capture the shift on camera but I hope the photos at least give an idea. Shift Happens is definitely a layering polish and not one to be built up alone – it would probably require about five million coats. In hindsight, it might have been easier to demonstrate the colour shift over a black polish but I applied it over Ebb Tide from Liz Earle’s Nail Colour range (which is released this time next week, by the way!). This manicure lasted for ages – I think it was an amalgamation of the Liz Earle base colour, which I know lasts well; Shift Happens and my all-time favourite China Glaze Fast Forward Top Coat. As for the flowers, well, this is the first time in over two years that I’ve busted out the Konad! My girl Sharmin bought one recently and it made me feel a little nostalgic so I dusted mine off and had a go. I’m definitely out of practice, the images aren’t stamped as cleanly as I used to be able to do it but I forgot how quick, easy and awesome the whole system is so who knows, maybe I’ll brush up on my technique and get back into it. If you’re interested, the polish I used to stamp the flowers was China Glaze Passion. 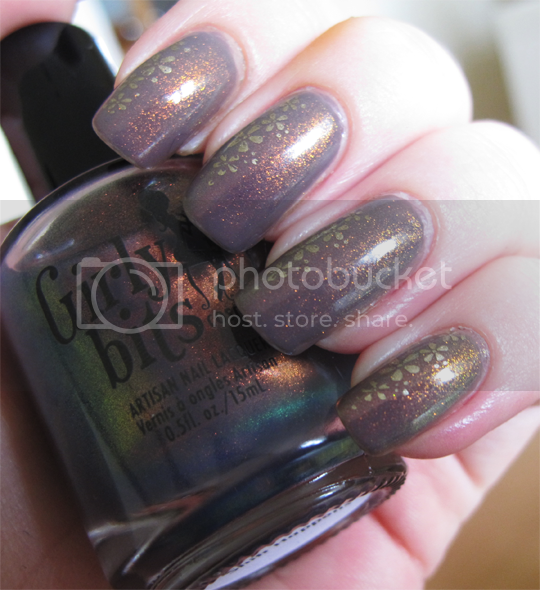 So, back to Girly Bits – Shift Happen is gorgeous and I’m excited to try out Erin Go Bragh-less, my other purchase from them. 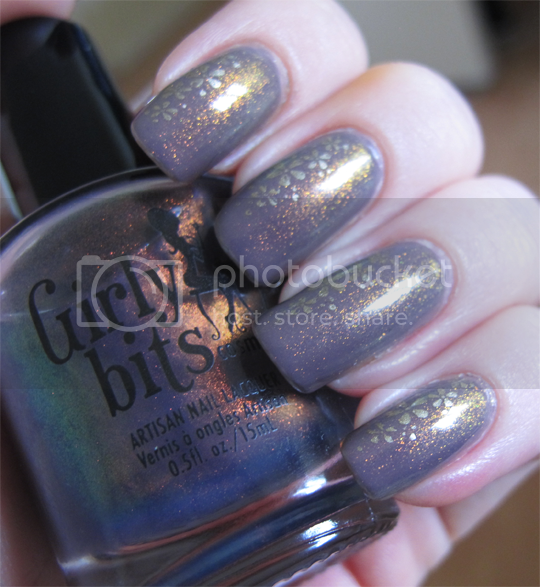 I would definitely recommend Girly Bits for their unique polishes and quick delivery from the US – get in on it!